Sick And Tired Of Diet Programs That Don't Work? These days how is anyone supposed to lose fat, and keep it off, following the slew of complex dieting programs out there? You know, the ones where they tell you to eat low-carb one day, high-carb the next, never mix fat with carbs, and forbid you eat after 7pm. Well I’ve got news for you… these diets DON'T work, and if they do, it's only for a very short period of time. But why is that? It’s simple; because they're unrealistic, confusing, and let's face it, they're just NOT practical. …too many people unknowingly get sucked into these diet programs only to grow frustrated with their lack of results and realize shortly thereafter that they're nearly impossible to follow, let alone enjoy. If you're like me and had it with those “all-hype and no-substance programs”, then it’s time you dump the disappointing diets and switch to my Simple Nutrition for Fat Loss System. Simple Nutrition is just that  simple. It’s an easy and enjoyable way of eating that doesn’t restrict your carb intake. Basically, by following the Simple Nutrition lifestyle you'll never feel deprived of carbs again  in fact, you’ll be shocked at just how many carbohydrates you can eat. But it gets even better because as you're eating a variety of delicious foods, your body will naturally and effortlessly be in “slim down” mode. It's a WIN-WIN meal plan. Discover the best fat-burning ratio of healthy meals to cheat meals so you can occasionally eat whatever you want and still maximize your fat loss results. The so-called “experts” tell you over and over again that you need to avoid these 2 types of food but the TRUTH is you NEED these forbidden foods to lose weight and overcome stubborn belly fat. It's a shame so many people leave out these delicious, fat-blasting, and nutrient-dense foods from their diets. But when you follow the Simple Nutrition System, you won't be cheated anymore. Eating for fat loss shouldn’t be a starvation struggle. In fact, just the opposite is true. Eating for fat loss should leave you full, satisfied, and bursting with energy all day long, with ZERO energy crashes. Finally discover the truth about detox diets  the truth that no other expert is brave enough to say. In fact, you’ll find out exactly why these popular "detox" trends you always hear about are NOT the ideal way of eliminating pollutant build-up in your body. Once you see how easy the 7-step detox nutrition plan is, the one that I personally follow every day of the year, you'll wonder why so many people still follow those ridiculous liquid-only diets. Have you ever thought, "If I knew exactly what the fat loss experts regularly eat then I could lose weight so much faster and easier"? Trust me… you’re not alone. I get this request dozens of times a day, so I’m opening the door to the Turbulence Training Kitchen and giving you my exact grocery shopping list AND my personal nutrition plan in which I walk you through my entire day, divulging every detail about what I eat and when I eat it. You'll also find a sample meal plan to follow so you can quickly remove all of your bad eating habits. Once you've mastered the Simple Nutrition lifestyle, you'll have no problem crafting your own healthy fat burning meal plan. Inside the “Drink Your Way Lean” blender drink recipe guide, my friends and I share our best morning blender drinks, post-workout shakes, and green smoothies to keep you energized, boost your health, and even help you lose fat faster  and all it takes is just minutes to make. I promise that your entire diet and outlook on eating will change by these amazing recipes that are so simple, even ol' kitchen clutz Craig Ballantyne can prepare. PS - If you are sick and tired of confusing and complex diets, then stop the insanity and switch to the Simple Nutrition for Fat Loss System for only $7. 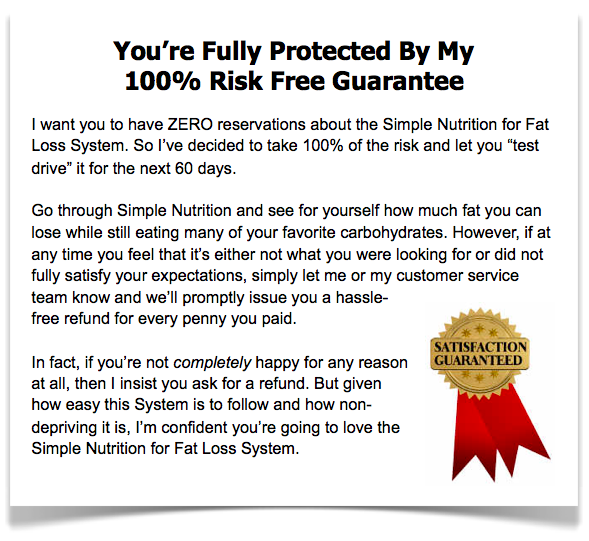 PPS - Your results are guaranteed by my 100% money back promise. If you aren't satisfied with your results from the Simple Nutrition for Fat Loss System, just let me know and you'll be refunded your $7 immediately.